The San Francisco Municipal Transportation Agency (Muni) oversees bus service in the city of San Francisco. Muni is a comprehensive system of buses that run throughout the city and they can get you to within a block or two of almost anywhere in town as quickly as possible. Transferring from one bus to another is free for 90 minutes after you purchase your ticket. Most routes begin between 5a.m. and 8 a.m. 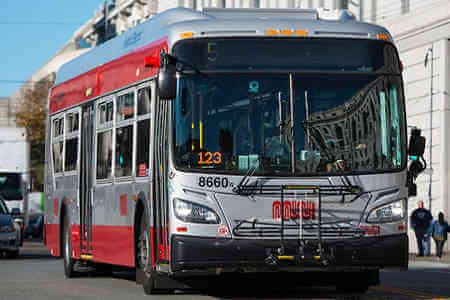 Most routes end between 11 p.m. and 1 a.m.
A single ride fare on Muni is good for 90 minutes of travel and can be used on a single route or a trip with multiple transfers across buses and light rail. Note: Eligible Youth and Seniors must apply for and receive a Clipper card before they can purchase the discount monthly pass. Valid on all Muni vehicles including cable cars. Animals are welcome to ride on Muni buses during off peak hours. if your pet is not a service animal, you must pay a fare equal to yours for your pet. Note: A single ride fare on Muni is good for 90 minutes of travel, whether it be on a single route or a trip with multiple transfers across buses and light rail.